Darlings, to the left you will spot Jimmy Choo’s ever-charming Vamp Sandal in Black Suede – the very same pair seen donned by Erin Wasson, Diane Kruger, Demi Moore, and Kyra Sedgwick; to the right plant your pretty peepers upon Nine West’s classy Krysten in Black Suede. While Krysten sports a heel that is ever so slightly higher than that seen on the Vamp; for a mere $99.00, in comparison to the $750.00 required to spice up your shoe collection with Jimmy Choo, she is every bit as capable of making one feel like a cover girl – at a price fit for the frugalista! Thanks to Nordstrom and Nine West for the pictures. Those Nine West are a very nice price! Hi! I'm Halle, from classicglamblog.blogspot.com. I'm glad you liked my sunglasses post!! Please, check out my blog? If you like, your follow is appreciated! By the way- that's an amazing dupe you found!! These are such an amazing find! Wonderful Sunday post! A great shoe! So love the price and look! Awesome! Love that price! Hope your weekend is a good one. What about follow each other?kisses! oh my gosh, you are so good at finding these steals. they're practically the same thing. except for the gold and silver padding difference. So beautiful I love the heel on the Jimmy Choo. I like the Nine West version better...because the heel is wider and I may be able to walk in them hehe! Oh, those are gorgeous! Nine West for sure! Must go with the Jimmy Choos -- so elegant! They look almost the same...I would of course buy the cheaper...this is a very nice blog post of sharing us how to shop better. oh am still obsessing over choo wedge. I like Jimmy Choo in this case. Ah, for the first time, I'm going to have to splurge! The Choos looks sleeker and more elegant with the heel. The Nine West ones are still fab but I like the JC ones a bit more! Great find! Gorgeous shoes ... 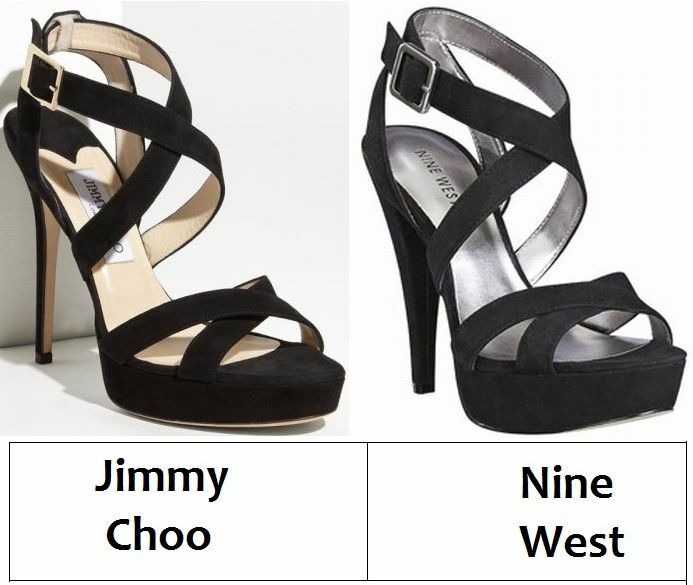 I'd definitely go for the Nine West ... like I have a choice LOL.